Are they sprites or voice work? Both Ill need some code work done around Christmas time. Well idiot me forgot to backup my files so the work I had finished was lost during a hard drive crash. awww man. sorry to hear that bruh. well i hope you find time to want to do your stuff over again bruh. trust me , i know the feeling. i keep sd card and all i can for backup content. save all spritework in a pm to yourself. If can form a sheet or various sheets, then just upload to whatever host image you use and just pm the sheets to yourself in png, bmp or gif format only. 2. save your stuff to a host image site or any file holder account like sendspace or mediafire. so even if your cpu crashes , and once you back online all the work done is saved on there and just do your account info and its there. I would rar or zip the files in sections so you know what is what. Saves time and space. I have dropbox as another file holder. I do and will be shrinking it down more since i only have the basic and it doesnt hold as much, till i upgrade. still yet another way to save stuff offline on actual online as well. hope these help you if ever decide to continue and restart your work or recover it all. good to see ya here man. been awhile bro. Good looking sprite I see there, Shadman. :) Who is that guy? Sorry for asking. I'm not familiar with that guy. 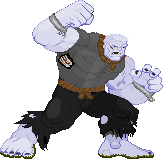 I know he's a Hulk edit. Just want to know. EDIT: Thanks for tellin' me over at CC chat of his name. 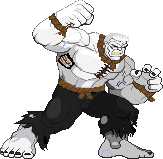 Solomon Grundy.